One day only deal. Get it while it’s hot. The Instant Pot 8-quart multi-use programmable pressure cooker is down to $99.95 on Amazon. 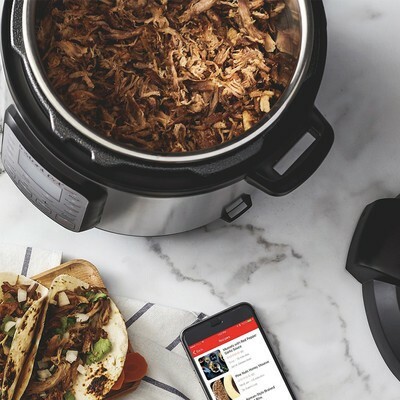 We share lots of Instant Pot deals, but almost all those deals have been for the 6-quart size or smaller. We haven’t seen a deal on the 8-quart since Black Friday, and that was a less advanced model. If you have a larger family or very hungry children, you should go for this larger cooker. This price is $60 off what it normally goes for, but this deal is part of Amazon’s Gold Box deals of the day and won’t last long. The 8-quart Duo Plus is meant for families of six or more people. It can work as a pressure cooker, slow cooker, rice cooker, yogurt maker or egg cooker. It can also saute, steam, warm, sterilize, and make cake. The 15 microprocessor-controlled programs make it easy to get the settings right. Users give it 4.5 stars based on more than 3,000 reviews.